Kaytek the Wizard Is Magical!Like many young boys, Kaytek is both mischievous and kind, playful and serious, creative and destructive - unintentionally, that is. Author Janusz Korczak was familiar with troubled youths, those children who some educators might classify as “emotionally disturbed” or as having some form of ADHD; after all, it was Korczak who, in 1912, founded Dom Sierot, an orphanage for those Jewish children in his native Warsaw nobody else would take in. Even before he founded his famous orphanage, Henryk Goldszmit (Korczak’s name by birth) recorded his observations of the children of the working poor who played outside his apartment in “Dzieci ulicy” (Children of the Street). And, as a young boy, the ever-contemplative Henryk imagined what life would be like if he possessed magical powers. Indeed, this question never left him in his adult years, and it formed the basis of many a discussion with the youngsters in his care.Kaytek is just such a boy – a child with a powerful imagination, a child like so many other children, sometimes impulsive and all too often unaware of the consequences his actions will bring. Korczak, with his characteristic love and caring, introduces us to Kaytek as a boy who likes to make bets, both as a thrill seeker and as someone naughty but clever enough to use the bets to earn easy money through trickery. (At this point it might be worthwhile to compare Kaytek with the hero of an earlier book, “Big Business Billy.”) Kaytek teaches himself to read; perhaps, like young Henryk himself, his curiosity is never satisfied; rather, it keeps expanding, which leads him to wonder what it would be like to have magical powers. Kaytek’s wish was also the result of his being teased in school for his lack of athletic prowess and general clumsiness. He quickly realizes that his thoughts can make things magically happen, which leads to a great deal of unintentional mischief. (As a side note, anyone who has read “King Matt” will recognize the invisibility cap from that beloved classic work.) However, Kaytek also uses his magic to give his teacher a rose, as he can see he upset her.Unfortunately, though, Kaytek’s impulsivity leads him to cast spells that wreak havoc and utter chaos throughout Warsaw. He leaves the Polish capital, both to escape what he has done and to find a way of controlling the consequences of his magic. 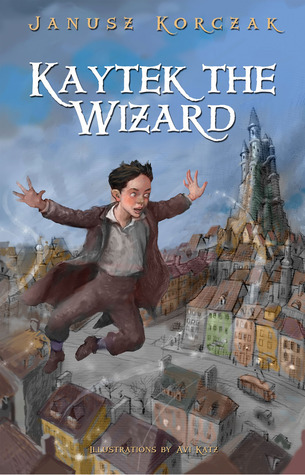 Herein lies one of this book’s many ironies: Kaytek wants to be a wizard because he feels he has little control in an adult world (such as being accused by parents and teachers for acts of which he is entirely innocent), but the magic seems to gain control over him. In other words, Kaytek is trying to learn about power and the responsibility that comes with possessing it. Kaytek is also a metaphor for children in general, in that they are all too often not taken seriously by adults – that too many adults act without considering the welfare of the child. These are classic themes of Janusz Korzak’s writings, both fictional and pedagogical. There is no – and cannot be – a happy ending, but there is always hope. This book represents the first English translation of one of Korczak’s works since 1990; that it was published in 2012, celebrated as the Year of Janusz Korczak in Poland and elsewhere (in honor of the centenary of his founding of Dom Sierot and in recognition of the 70th year of his death at Treblinka). In life, the Old Doctor was a masterful storyteller; his books (like the oral tales by which he is remembered by former orphans) are entertaining and educational, serious but with gentle humor, a delight for those children lucky enough to read him them and adults willing to listen. I have been very interested in the work of Janusz Korczak as one of the first advocates of children rights and this second I read from him made me think a lot about how children see adults. Here are a couple quotes I especially enjoyed:p. 77: "Anyone who wants things to be easy is a dope. Things that are hard are interesting."p. 81: "What has good conduct got to do with his studies? If he knows his lessons, he should get a good grade. A hooligan can be a good student, and a quiet kid can be a lazybones or a dimwit. Why bother study to study if they don't respect you for it?"p. 158: "Zofia is a good guide - she shows him everything and explains it all so understandably. She stops in each spot for just as long as necessary to see and remember. Every time he asks a question she either gives an instant reply, telling what she has seen and known for sure, or else says at once: "I don't know. Maybe Mom will know. Maybe Andrew can tell us. We'll ask the people from the village, It's totally different from at school, totally different from a nature trip. She never once says Kaytek's question is unimportant or stupid; she isn't surprised if he doesn't know something, and she never says he ought to know that by now. "A lot of food for thought for adults and teachers! Kaytek the Wizard by Janusz Korczak (1878-1942)Originally published in Polish as "Kajtus Czarodziej" in 1933Illustrated by Avi KatzEnglish translation by Antonia Lloyd-JonesPublished byPenlight PublicationsAt first glance only, I was not too taken with this book. I did not like the attitude or the smoking of this young boy. However, on realizing first that this was another era and second, that it was taking place in a different culture of which I knew little, I sat back and refocused. I'm glad I did.Kaytek's real name is Antek, but a chance encounter changed his name, so as far as the schoolboys and Antek himself decided, he went by Kaytek. He is a boy who is very clever, too easily distracted, full of energy and questions, disruptive, and in general what we might say today as hyperactive or even ADHD.Keeping in mind that he is growing up in pre-WWII Poland where poverty is prevalent and imagination is an escape, it is no wonder that Kaytek's only desire in life is to become a wizard. Through being a wizard, he comes to learn many of life's lessons as a result of his many failures due to lack of thinking things through.The book has its charms, and is a good look at how children interact in a way we now call "bullying." Entertaining as it is, Kaytek often creates pandemonium with his wizardry. He must learn through his special abilities how to be rational, how to think of others, how to avoid capture, and so much more. On the flip side, we see how adults, particularly in this time period, treat children, use them as providers, physically abuse them, and allow them no rights.Overall, once into the book I could soon see that it is basically a fable, a morality tale. We all grew up with similar books and stories, this one just happens to be more in depth and with more to say. I'm not sure what age this would appeal to now, 80 years later. Possibly 12 and over. It is an interesting read about a time and country not too many people in North America knew much about in the 1930s. There is a very good Translator's Afterword, explaining why and how the author, a champion for childrens' rights, wrote a book of this nature, which I found very compelling. This is a delightful book, but it becomes tragic when you know that the author Janusz Korczak led his last group of orphans from the Warsaw Ghetto to Auschwitz.Author's Dedication … "This is a difficult book. I dedicate it to all the restless children, those who find it hard to change and improve. You have to want to change, very much and very deeply. You need to strengthen your will power. You need to play a useful role in life. "Chapter One … "Kaytek goes into stores and pretends he wants to buy something, though he doesn't have a penny. "end of Chapter One … "So that's what Kytek is like. Impatient. Full of ideas. He was like that before he ever went to school. He was like that before he became a wizard. "From my novel in progress (draft) ... “How many children are here?” she asked.“Forty-five.”Anna opened her handbag, took out a bag containing fifty small coins. She gave them to Korczak. “Hanukkah gelt,” she said. “Thank you,” Korczak said. “Now I have something for you.” He reached for a thick file and laid it on the table. “Here’s something I’m working on, but I need help. It’s a story about a boy who wants to become a wizard and is surprised to discover that he’s actually able to perform magic spells and change reality. But soon his powers cause chaos in Warsaw and he has to leave. What do you think?”“It sounds fascinating. The children will love it.”“Good, then you’ll help me? I need someone to edit my manuscript. I think you’d be perfect. Will you do it?”“I would be honored,” Anna said, and she meant it. It would be very special to work with Janusz Korczak, who was one of the most revered Jews in Warsaw, respected even in the gentile community. Anna left the orphanage in such high spirits that the thieves, prostitutes, and pimps on lower Krachmalna Street, and even the pervasive stench of rotten fruit and cooking oil, did not dissipate her mood. NOTE: Anna is my main fictional Polish character in a novel set in Germany and Poland during the Nazi years. 3.5/5 - Very different from today's fantasy novels about wizards. I enjoyed Kaytek the Wizard as much for learning about how children's literature has changed as anything. The storyline is rather odd and flat. Kaytek decides he wants to be a wizard and practices making things happen by saying, "I want, I demand . . . [whatever he wants]." He's a bit of a brat so he plays a lot of pranks and causes trouble. When he tries to do good, he finds that he's misunderstood and is driven from his home in Warsaw. He travels the world for a time, then eventually returns home.Some warnings: The book is unfinished. It was apparently published in serial form and the author read it to his orphans (he ran an orphanage) and crossed out things they found too frightening (from my understanding, the scary bits were published in serial form) but didn't make changes to them because the book was apparently already pre-publication and he didn't have time to fix those problems. So, there are big gaps where you have no idea what happened in Chapter 12 (I think it's 12) and then shortly after that, the the story just stops. I knew the book was incomplete so that part didn't bother me, but I didn't care for the unexpected gaps. However, the book was originally published in 1933 and the original "scary" parts that were removed no longer exist in any form. The author died with his orphans in Treblinka concentration camp. I think that was part of the reason I read it. I was curious about the author, who was well-known in his time. I advise reading it for historical context, but don't expect a modern adventure. Kaytek is quite different. Footnotes and notes by the translator help the book to make sense and to give it added interest. The book was quite interesting in the beginning as it imparts a really strong sense of Polish culture. It eventually lost its interest as Kaytek never progressed from moderately tolerable to someone actually likeable. Overall, the story doesn’t seem to have a very strong arc, particular when Chapter 18 is left a moth eaten remnant by the author’s edits after being told that these parts were too scary by a child- very authentic and accurate, but not particularly enjoyable as a read.The best parts were definitely those in which Korczak’s views about the relationship between kids and adults and attitudes toward education were most evident. I found myself taking a rather academic interest in the book as treatise on childhood studies.I like the presence of the footnotes and the depth of the afterward but I’m not sure that the footnotes are the correct ideas to bring up or that the authors notes are even best suited to an afterward. Many of the ideas would have been useful before reading rather than afterward. Many of the ideas of race referred to the afterward but it was difficult to locate them while reading so I thought these things were actually more appropriate to include as footnotes than the geographic things that were mentioned. This is an odd book. Its plot is almost picaresque in structure, though there might have been more of a climax and resolution if the author had rewritten the parts he crossed out and also if he had written an ending. Maybe if he hadn't been so busy with his orphans in Poland or if they all hadn't died in ths Holocaust, he would have. You see Nazis, things like this are why no one likes you. Overall, it's a neat, if slow read, despite its brevity. I'm glad I read it though I'll probably never reread it. Overall a great book with great insight into an age preceding World War 2. Not a big fan of pretending kids should have all the same rights as adults, but that's not excessively heavy here. Overall, good thinking and empathy. Good treatment of many themes.The episodic and wandering nature, lack of coherent plot, deleted scenes, and lack of conclusion all weakened this for me. That's why 3 stars instead of 4. The bits of occult stuff bothered me, too, but it wasn't heavy.Overall a book worth reading. Read about the author, too. Overall, quite the remarkable guy. A Polish book from the 30s that has recently been translated. It's a rather odd book, and an unfinished one (literally--it just ends in the middle of the action without any kind of conclusion), but I'm not sorry to have read it, although I very much doubt I'll ever want to read it again. Kaytek is an impudent boy who uses magic to deal with the grownup world. Author Janusz Korczak helps children and adults live in a world with each other. It's flat, wooden, and weird. Written in 1933 by Polish physician and folk hero Janusz Korczak, this is a 2012 translation into English with new Harry Potter-esque illustrations. Sorry, just could not finish this. Might be the translation, might be the story. I found it all too improbable and no consistency as to the plt (there was one???) nor the development. Abandoned! Very inventive story. It kind of dragged on though. Also I it hard to follow in places and choppy.